Green Leaves Entertainment is a talent company that once managed magicians, photo idols, fortune-tellers and a host of other entertainers. When the last client quits, the president of the agency, comes up with creating an idol group. The girls selected all desperately want to become idols, and they learn that it takes a lot of effort to become famous. President Tange of Green Leaves Entertainment has a plan to save the failing company. With Matsuda’s help, they develop a plan to scout raw talent form a new idol group. The idol group “Wake Up, Girls!” performs in their debut concert, but when their agency president disappears with the company’s money, can new manager Matsuda save the group? The girls seek help from Producer Sudo, but his proposition to increase their popularity involves skimpy swim suits for male customers. Is shady Sudo really trying to help? Things are looking good for the “Wake Up, Girls!” after their TV appearance, but as their popularity spreads, so do rumors about ex I-1 Club Member, Mayu. The girls are getting ready for their second concert, but trouble appears when they realize that their concert is on the same day as I-1 Club’s concert. 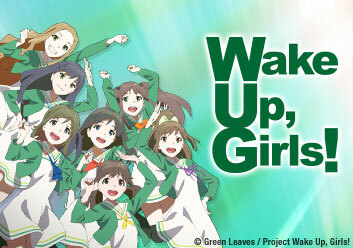 I-1 producer, Hayasaka, is interested in producing “Wake Up, Girls!” But will his harsh demands, and even harsher training, break the unity of the group? Hayasaka wants to remove Airi from the idol group due to her lack of improvement. Will the girls defend her? Or will they sacrifice their friend for the sake of the group? The group enters the annual Idol Festival, and the stakes couldn’t be higher! Idols from the around the country will compete to be number one. Do they stand a chance? Mayu doesn’t want to talk about her previous history with another idol group, and it causes tension between the girls. The unexpected happens, and the girls are forced to learn a difficult new song with new choreography. Can the girls rise to the challenge? The final performance approaches, and the girls realize that something is wrong with Yoshino! Turbulent emotions and new challenges abound as the girls take to the stage!